All Threads is more than just embroidery thread! Here's our entire catalog, featuring Robison Anton embroidery thread, prewound bobbins, stabilizer and other supplies. Robison-Anton embroidery thread is our specialty! We carry every available color of every Robison-Anton Rayon and Polyester embroidery thread variety -- in fact, we have nearly 1200 thread colors in stock right now! Quilters - now you can get a quilting thread with the same great quality as Robison-Anton's embroidery thread! These threads are excellent for both machine and hand quilting. We carry every available color in the standard 50-weight cotton quilting threads. Don't miss the exciting Cotton Thimbleberries Collection! Invisible nylon monofilament and a water-soluble basting thread are both handy items to keep in your sewing room! Great time savers - spend more time embroidering, less time winding and changing bobbins. 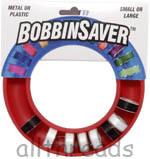 Economical spools for winding your own bobbins. Scissors for embroidery and quilting, featuring Gingher brand scissors. Finally! A place to store your bobbins and keep them from unwinding! We carry a complete selection of cut-away, tear-away and water soluble embroidery backing. Perfect for temporarily attaching stabilizer to fabric. The finest quality embroidery needles available! A great pen for transferring quilting patterns, marking your hoop location and a thousand other uses. Marks disappear like magic in about 3 days. We also offer Gift Certificates in $25, $50 and $100 amounts!